IMDb is a legendary resource, of course, started independently and now owned by Amazon, but chock full of professional and amateur-added information on millions of movies and TV shows, plus millions more actors, actresses and directors. As such, it's a resource that almost everyone, regardless of age or inclination, will be interested in, partly explaining the super-high score given here. 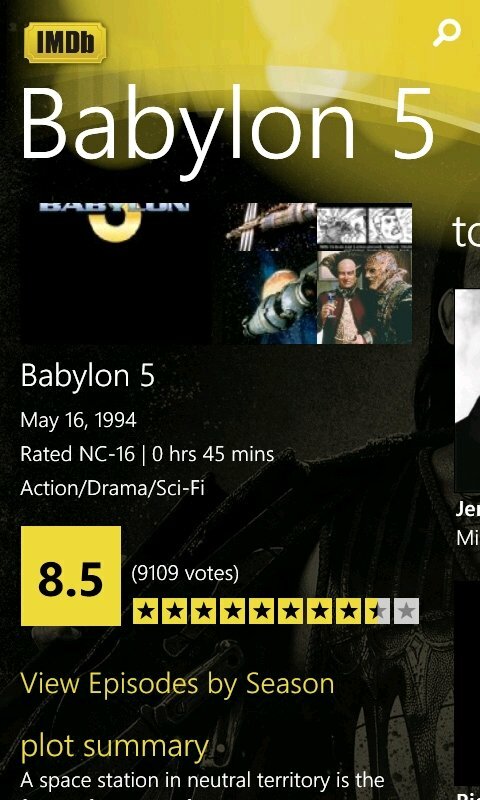 It helps too that IMDb's freeform-yet-everything's-related structure works well in Metro UI and that this is a really super implementation. As on the web version on the desktop, you'll look one thing up and then spend the next hour going from film to actress to film to TV show to supporting cast to trivia to other works. And so on. It's addictive. 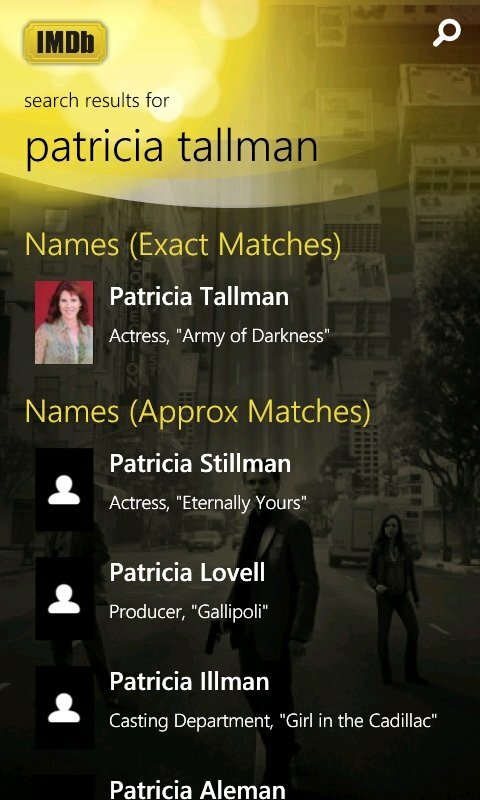 Special mention has to go to the sheer colour and style of the IMDb application - as you can see here, photos and movie posters are picked (at random) to appear as backgrounds for your queries and for general pages. They're nicely darkened/graded so as not to interfere with readability and they're also largely AMOLED-friendly, i.e. with white text on darkish background where practical. At every stage, more information is only ever a swipe left away, or a tap away by tapping on a new title or graphic. 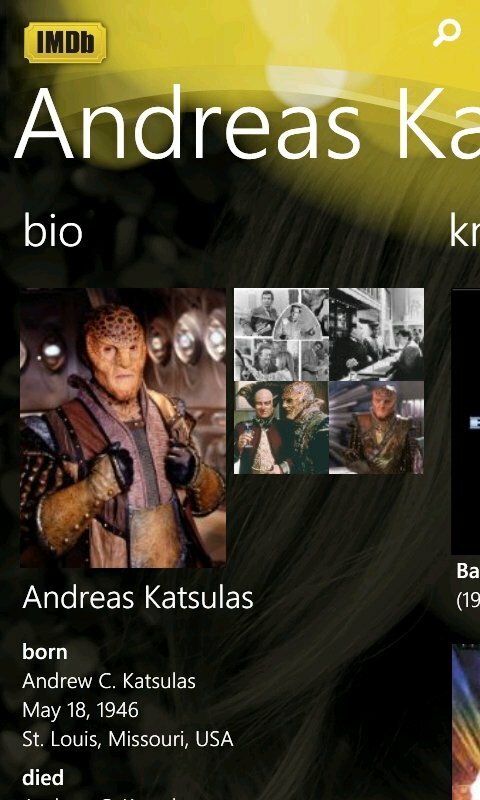 The chain of information is simply beguiling - I started out looking at what Pat Tallman (from B5) had done and ended up digging into Andreas Katsulas' filmography, discovering that it was he who played the 'one armed man', Sykes, in another of my favourite watches, 'The Fugitive'. For every movie or show (where possible) there are both critic and user reviews, another long time favourite pastime of mine, going back to things I enjoyed watching and seeing what other people made of them. 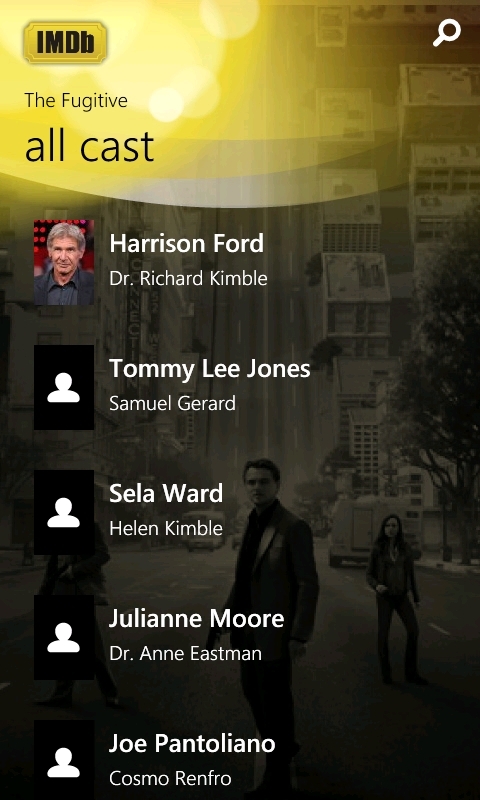 In case you're wondering, to get back to the IMDb app 'home' at any stage, just tap on the logo, top-left. Similarly, you can start a new search with a tap on the 'magnifying glass' icon, top-right. Although super, the implementation here isn't perfect - after all, the programmers need to have a few things to keep them busy through 2012...! 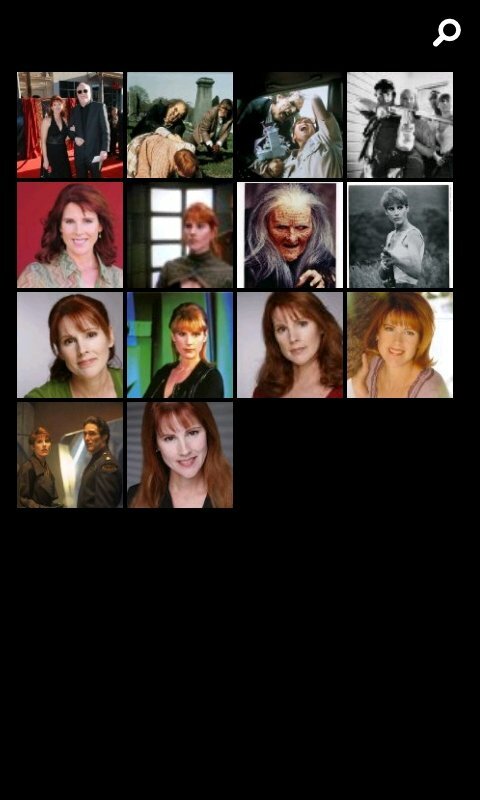 Browsing through a photo gallery (above left) brings up each photo to fit the width of the smartphone screen (480 pixels wide), but you can't zoom in, you can't rotate the phone for a larger view and you can't save the image to the phone. Definitely a little work to do here - I can't believe all these minor issues are do with image licensing problems. In addition, and again this is a comparatively minor issue, many lists of actors are missing their thumbnails (below, right) - even major stars like Tommy Lee Jones, so it's not as if the databases are missing some of the more obscure actor details. 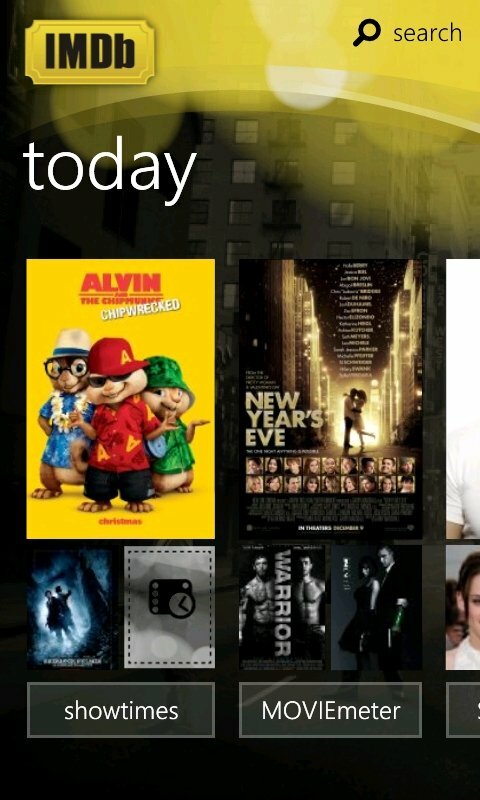 Finally, IMDb isn't optimised for Windows Phone Mango yet - try to switch back to it using the 'multitasking' system and the application starts up from scratch, albeit remembering where you'd got to in your last IMDb browsing session. Put these minor quibbles down to my insane desire for a version 1.3 - did I mention how much I love this app? Even in its current state. 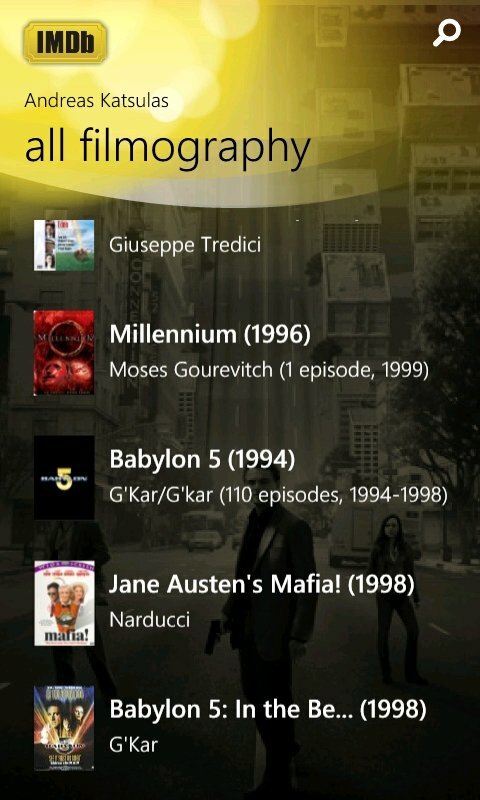 Given that IMDb is totally free and that everyone is interested in films and TV to some degree, I cannot see any reason why every Windows Phone user shouldn't have this application installed right now. Just do it, you'll thank me later!